Last Thursday, I discussed the first 10 of my 31 ways to jazz up your booktalks. Today, we will explore the next ten tips. 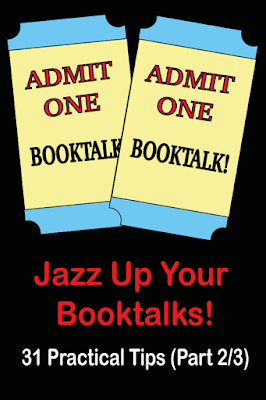 This week's tips focus on making your booktalks theatrical! Make them yours! Make them fun! Next week, we will wrap up this mini-series with the final 11 booktalking tips. TIP 11: BOOKTALK TITLES THEY DO NOT ALREADY KNOW. 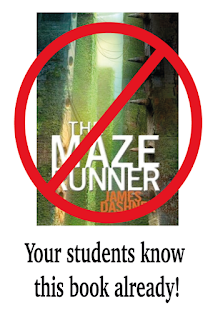 My students know The Maze Runner, The Hunger Games, Harry Potter, and Divergent already. If I mention these titles in a booktalk, it is only a brief mention to compare them as readalikes for something new that has come out. Students don't want to hear about books they already know about. If the book has been a movie, and the movie's been out awhile, you really don't need to booktalk it anyway. The books will get checked out whether or not you talk about them. You only have your students for a short while; don't waste their time talking about titles they already know. TIP 12: PAIR FICTION WITH NONFICTION. Early in my library career, I hardly booktalked nonfiction at all. I didn’t really read nonfiction myself, and my students seemed more interested in fiction anyway. But I now make a point to include several nonfiction titles in every booktalk. Many fiction titles have historical context or can be compared to historical events, and there is truly some fabulous narrative nonfiction available in the past couple of years. Try pairing Andrea White’s fiction novel Surviving Antarctica with Shackleton: The Story of Shackleton’s Last Expedition 1914-1917. Or maybe try Nathan Hale's graphic nonfiction Donner Dinner Party (2013) with Skila Brown's To Stay Alive: Mary Ann Graves and the Tragic Journey of the Donner Party (2016). Fiction/nonfiction pairings is a huge and really fun topic! I've added it to my lists of future podcasts; stay tuned over the next couple of weeks. TIP 13: USE BOOK TRAILERS. Okay, I realize that you are probably already doing this, but just in case you are not...you totally have to start! Students LOVE book trailers, and they are all over YouTube, BookTube, and TeacherTube. If you can't get around your school's internet filter, you can always download the trailers from home using Download Helper, a free and easy-to-use Mozilla plug-in. Number one rule for using any video from the internet with your students: You must, must watch all your trailers all the way through before you show them to students. Because you just never know where that trailer is going if you don't watch it first. Trailers should be high-quality and high-resolution (not pixelated). Know that if you are playing the trailers straight from YouTube, there may be ads that might not be appropriate in a school setting (beer, sanitary pads, Rated R movies, etc.). Make sure any trailers you choose are short (ideally, less than 90 seconds), and most of all, interesting. There are far too many fan-made trailers out there that are so bad, they will likely make a reader NOT want to read the book! Showing no book trailer is better than showing a poorly-made trailer. This one from Raina Telgemeier and Graphix is a great example of an engagine book trailer! It's short (only 30 seconds), it introduces the major characters and plotline, the artwork is eye-catching, and the sound stays at a consistent volume. UGH, I cannot stand when the volume goes way up and then way down! TIP 14: DON'T FEAR WHAT YOU HAVEN'T READ. I’ve heard many librarians advise against booktalking a book you haven’t read. I get why some would be uncomfortable doing that, but I completely disagree with this idea. If you only booktalk what you’ve read, you are limiting your booktalk range. If I took this advice, all my booktalks would be about dystopia and fairy tales. I would never booktalk action-adventure or nonfiction or--gasp--sports fiction. You absolutely can booktalk books you haven’t read. I do it ALL THE TIME. Read the blurb. Read the first chapter. Show the trailer. Read some reviews. Talk about why you want to read it. You do need to know something about the book so you have something to say, so be ready to talk about something. Booktalking books you WANT to read models making a "to read" list. Give it a try! My podcast booktalks are all themed: Free Verse novels, Civil Rights and Racial Inequality, Top 10 books I want to read in 2017. My next podcast, which will post on Tuesday next week, will be a Chinese New Year theme. Themes help make your booktalks fun, and they can help students remember the books they want to read more easily. Try themes like “baseball” or “unwanted gifts” or “green covers.” Thematic booktalks can also help prevent you from constantly booktalking the same familiar genres or titles and enables you to explore books you might not have even heard of. Some of my thematic booktalk ideas--please feel free to download and edit according to your library's needs! I also have more thematic lists here. I love themes!!!!! TIP 16: USE MOVIE CLIPS OR MUSIC. I've done so many of these! I once did a booktalk presentation at a librarian conference in Texas based solely on Beatles songs! I've done a booktalk on bullying by showing the music video for Taylor Swift’s “Mean.” I've started a booktalk on Ancient Egypt with a scene from “The Mummy.” I once showed a clip from National Lampoon's Christmas Vacation (where Clark gets the Jelly of the Month Club membership) for a booktalk on Gifts That Come At a Price. Fun stuff! Pick your favorite movies or music and just go with it! I promise you, the kids (and their teachers) will eat it up! Note: I love Prezi, but here in China, the internet is too slow for it to reliably work in my library. I can access it, but nothing shows, and sometimes, it locks up my computer. I use PowerPoint exclusively here, but that is only because my Chinese internet connection isn't Prezi's friend. I'm hoping you can see the presentation below, because from my end, it's just a huge black square. TIP 17: IF YOU ARE GOOD AT BOOKTALKING A PARTICULAR TITLE, ORDER MULTIPLES. If every time you booktalk a particular title, the book gets checked out and holds get placed, you are obviously good at generating interest in that title. For me, this is most definitely The Selection by Kiera Cass, Unwind by Neal Shusterman, Fish in a Tree by Lynda Mullaly Hunt, and The Leaving by Tara Altebrando, among others. I have multiple copies of each of these books, and they stay checked out. It makes no sense to have only one copy of a popular book. Order more copies in paperback—as many as you need—and booktalk on. I'd rather have multiples of something the students love than a bunch of single copies of books that will gather dust. TIP 18: SPOTLIGHT AUTHORS INSTEAD OF SPECIFIC BOOKS. Certain authors have a huge lexicon of books that are always popular with teen readers. 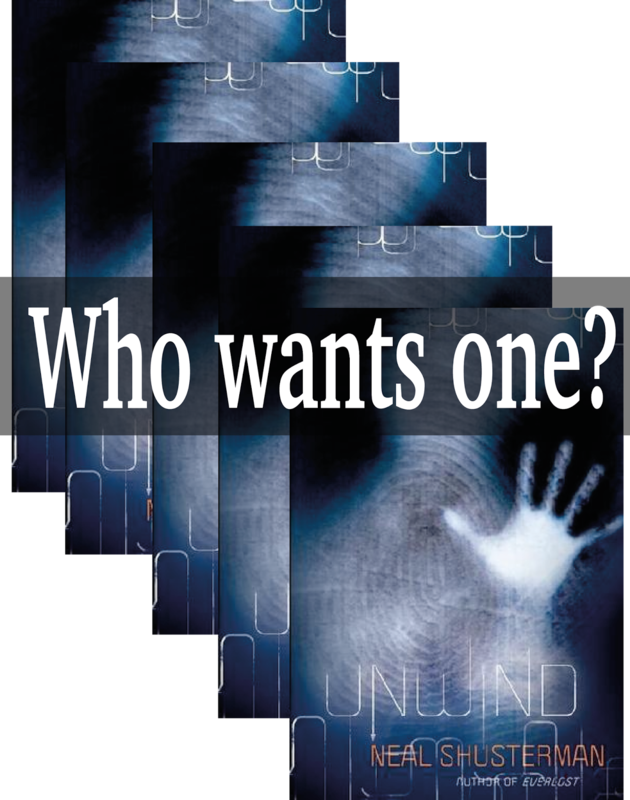 A booktalk on Lois Duncan or Chris Grabenstein or Doug TenNapel or Avi or April Henry or Neal Shusterman, all of whom have published loads of high-interest novels for teens, can result in lifelong fanboy or fangirling for some readers. A fun idea for Valentine's Day: spotlight YA author couples like Tom Angleberger/CeCe Bell; Michael Grant/Katherine Applegate; or Chris Barton/Jennifer Ziegler. If a particular author is popular in your school, sent him or her an email to ask about the possibility of Skyping. Skype makes authors way more accessible to our students than they were just a few years ago. If your school allows students access to Twitter (unlikely, I know), you could encourage your students to send tweets to their favorite author. This would also be a great way to teach about appropriate and inappropriate behavior online and how once you put it out there, it's out there forever. TIP 19: LET STUDENTS CHOOSE THE THEME. Once you have created multiple booktalks, you might try allowing the students to pick their booktalk theme. If your teachers are willing, partner two classes together and allow students to choose which booktalk they want to go to. They could choose Oceans on Tuesday or Artificial Intelligence on Wednesday. One teacher would come to the booktalk with the students; the other teacher would work with the remaining students. Switch the next day. TIP 20: SETTLE BOOK FIGHTS FAIRLY. Got students fighting over a book? Good for you! You've done a GREAT job booktalking it! This might be a book you need to buy extra copies of (see tip #17). In the meantime, if there is one book that everyone wants (yes, that definitely happens! ), I grab the book and do a "pick a number" game to determine who gets it today. I want the winner to be decided fairly and not just go to whomever is the loudest, pushiest, or fastest to grab the book from the display. Thank you for your tips! I'll be following your blog!